Bayern Munich avenged their 2-0 loss to Arsenal a fortnight ago as they ripped apart the Gunners in convincing fashion at the Allianz. It took only 9 minutes for Robert Lewandowski to give Bayern a lead, before he combined well with Müller to double the lead. David Alaba unleashed a sublime long-range strike on the stroke of half-time to put Pep Guardiola's men in a commanding position. Following the break, Arjen Robben knocked in from close range while Olivier Giroud scored in hindsight what was a consolation at most. 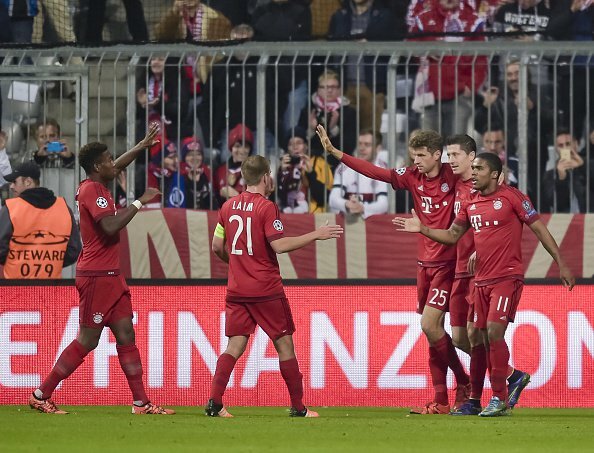 Finishing off the job, Müller swept in his second to complete Bayern's revenge. Arsenal kicked off the game and the Gunners had a fast start by knocking the ball around and Giroud let fly early. Bayern then got the ball and played well and kept the ball. Bayern took a shot and Lewandowski was playing well with a couple of shots. Lewandowski had shots but Cech was up there to save. Giroud got the ball and Özil was passing to Alexis and Özil got th ball back and gave it away, Arsenal got the ball back. Coman had tha ball for Bayern, Costa had a shot from distance... Well off target. Alexis Sanchez did well to cut in side but lost the ball. Müller got the ball, Coman got the ball and crossed in, it was said to be offside but Lewandowski scored a header. He was just onside. Campbell had the ball for Arsenal, played it into the box, Alexis got the ball and Özil scored. Bayern appealed and it was given as no goal, no equaliser for the gunners. Özil elbowed the ball into the net. Still Bayern in the lead, Özil got a yellow card for his 'handball'. Özil started the game well. Alexis went down but no foul was given. Coman got the ball and Cech made the save. Alonso, Lewandowski passed the ball and the polish mans shot was wide. Arsenal gave the ball away and Lewandowski's header was saved comfortably by Cech. Mertesacker defended well against Müller's effort at goal. Debuchy kept giving the ball away. Coman committed a foul and Arsenal wasted the free kick and Bayern got the ball. Alexis passed to Özil, Giroud passed to the German and Campbell made a good run and Bayern repossessed the ball from the Gunners. Javi Martinez got a yellow card. Joel Campbell also got yellow for his actions. Coquelin's great defence stopped Bayern. He chucked himself at he ball. Arsenal got a free kick and Alonso was booked. Alexis lost out when he got the ball. Giroud nearly got to the ball and Campbell missed the chance to equalise for Arsenal. The Gunners are causing problems for Bayern. The German side got a second and Müller scored. Bayern 2 - 0 Arsenal. Arsenal had given Bayern way too much space. Arsenal pressed forward, they needed a goal to still be in the game at half-time. Özil looked dangerous on the ball for Arsenal. Costa struck at the Arsenal goal and missed. Arsenal were getting punished ten minutes before half-time and Campbell went down and he got helped up and carried on Arsenal can't concede a third before half-time. Coquelin got he ball off of Bayern and he gave it away again. Bayern where relentless in the first half, it was too easy for Bayern as Arsenal let Lewamdowski and Müller try at goal. Lewandowski was always in space, he was playing fantastic. Bayern were given a lot of space that Arsenal gave the,the gunners defended better but they need to attack better as well. Lahm got th ball and Coquelin was too strong, Lahm passed to Müller and Cech saved the ball. Coman was fouled and he was in the thick of things for Bayern in the first half. The dynamic of the game changed as Bayern were dominant and the ball got crossed in and Müller missed. Gabriel did his best to defend to put Müller off. A venomous shot from Coman was saved by Cech. Arsenal weren't playing well and to top the game off Alaba added a third for Bayern and that was the goal of the game, he curled the ball past Cech from 25 yards. It was half time. The second half kicked off and Robben took to the field and Robben scored ten minutes into the second half. Bayern 4 - 0 Arsenal. Giroud had a good first touch but the ball didn't make it to Özil. Monreal nearly scored and Gibbs replaced Monreal. Bayern had 86 passes and Arsenal had 166 at the point of the game when Bayern made the game look like an exhibition. The cross from Özil took a deflection and Robben cleared. This result would've shocked Alexis and Özil because it was not a result Arsenal are used to seeing. Good defending by Bayern when the ball was drilled in from Campbell. Arsenal were just sat back watching Bayern knock the ball around. Boateng was replaced by Benatia. Arsenal should've been able to lift the spirits for the Arsenal fans and Giroud scored wonderfully, Vinatge Arsenal. Poor from Bayern. Giroud's goal was quality. Lewandowski was replaced by Vidal after Giroud's goal. Arsenal hadn't stopped being 4-0 down good spirit was shown. Robben was playing its Arsenal and used his weak right foot to trick the gunners. Koscielny was on the bench and he did right to after a hip injury, he should've played as should of Hector Bellerin but Spurs will be tough as well but the UCL and Premier League are seen as two different priorities for Arsenal. Arsenal played a high-line, Robben looked offside and Denuchy helped the ball away to reject a 5th for Bayern. Alex Iwobi replaced Giroud for Arsenal. The German side nearly got a number 5 and Müller missed. Calum Chambers took the place of Santi Cazorla. 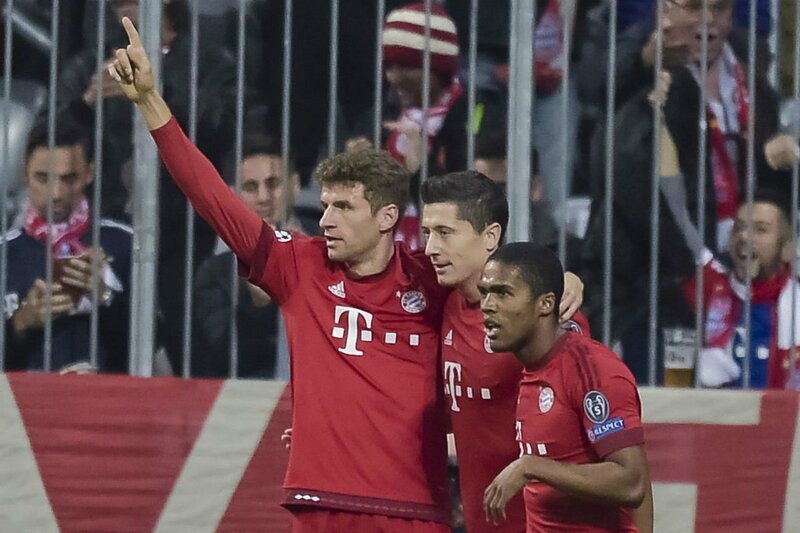 Douglas Costa found Müller and Bayern hit five against Arsenal. The gunners should've never lost the game by 4 goals, but they did and Bayern qualify and Arsenal have a chance if they dispatch Olimpiacos and Zagreb.